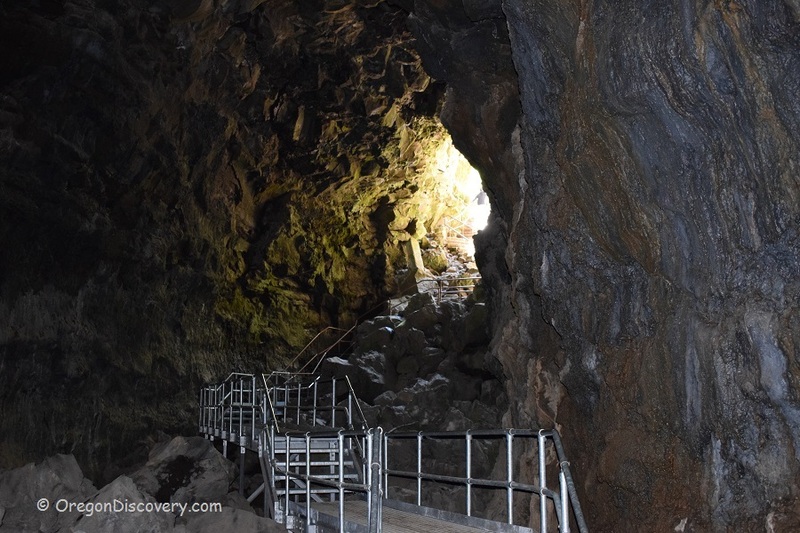 Located approximately a mile away from Lava Butte, Lava River Cave is a lava tube which was formed by the volcanic activity about 80,000 years ago. The longest known lava tube in Oregon stretches for 1.5 miles from the entrance through Echo Halls, Low Bridge Lane, Two Tube Tunnel to Sand Gardens. It takes about an hour and a half to explore this unique natural wonder of Central Oregon. The cave was created by lava flowing downhill from the point where it was emerged. The river of molten lava was flowing in the open air until the top of the lava river cooled down and solidified. The lava below the solid crust drained out of the channel and it left behind a phenomenon we see today, Lava River Cave. The cave was discovered in 1889 by a pioneer hunter, but a number of artifacts archaeologists find in the area, such as obsidian flakes, suggests that local Native American populating was aware of the cave before first European explorers discovered it. Lava cave is operated under the oversight of US Forest Service. 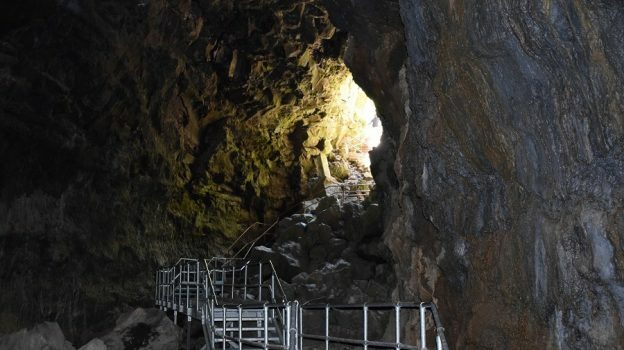 In addition to preserving that unique nature’s phenomenon, Lava River Cave is, US Forest Service also preserves and takes care of local bat population. Be advised that you will not get access to the cave if you have recently been to other caves, especially if you wore the same clothes. This is made to make sure you accidentally don’t bring any diseases with you which don’t affect humans but can negatively affect the cave’s bat population. Since the temperature in the Lava River Cave is about 42 degrees Fahrenheit year round, make sure that you dress up in warm clothes and close-toed shoes for your safety. Also, bring along a flashlight. You can also rent a lantern at the entry for $5. In addition, it would be a good idea to have a spare light source with you in case the primary one goes down. Public access is only allowed during certain times a year. Be advised that no pets are allowed at this site. 187 miles southeast of Portland. Turn left onto Cottonwood Road and drive 1.2 miles to Lava River Cave on your left.